Cast: Kevin Spacey, Jim Sturgess, Kate Bosworth, Laurence Fishburne. Story: Card-counting at casinos, loosely based on the real-life story in the book "Bringing Down the House" by Ben Mezrich. OK, it's not really real-life. Yes, there was a team of MIT students who learned how to count cards and won hundreds of thousands at casinos, and that's who the book was written about (look out for Jeffery the dealer - he's a member of the real team) - but the film drifts from the truth significantly in the interests of Hollywoodization. 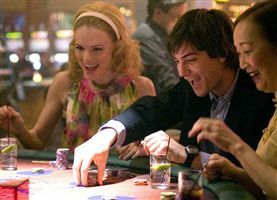 They do, however, explain the technique of card-counting pretty well, even if they simplify it for cinematic audiences and don't really tell us why it works. The idea, in case you're interested, is that by keeping track of which cards have been dealt, you can make a better guess at whether a high or low card is due to be dealt next, and adjust your strategy accordingly. This takes the probability of winning from just under 50% to just over 50% - so if you repeat this a gazillion times, you're bound to make a profit in the long run (this is how casinos make money in the first place). And you know, it's bloody clever how they make it look like anyone could count cards and clean up. These casinos are sneaky bastards. If they wanted to eliminate card-counting, all they'd have to do is use batches of 1000 packs of cards mixed up, instead of just a handful, then the card-counter's advantage would evaporate instantaneously. So why don't they do that? Because card-counting is not only very difficult (it requires 100% concentration, 100% of the time), its profit margins are very small. Most people who try it will end up losing money and whenever someone starts winning regularly, the casinos are perfectly entitled to kick them out. So it's in the interest of casino operators to make people think they can win by counting cards, give it a go and lose. Sneaky, clever bastards. As for the movie, I rather enjoyed it. Some of the minor details of the plot don't really hang together, but they don't damage the overall feel excessively. 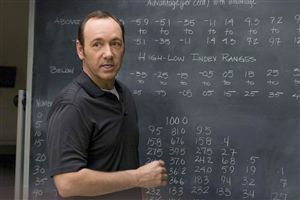 Kevin Spacey is always good value, lending his dour presence as required, and Jim Sturgess successfully hides his English roots to make a satisfactory if unremarkable lead, with Kate Bosworth (Lois Lane in Superman Returns) still looking young enough to pass as a college student. 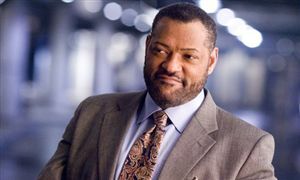 The story develops just enough to keep us interested over the two-hour running time, with the legacy rivalry between professor of card-counting Kevin Spacey and the casino "Loss Preventer" Laurence Fishburne (Morpheous in The Matrix) gently brewing before coming to a head at crunch time. It's these crunch parts that could use some extra suspense - but then director Robert Luketic has a history of pap such as Monster-in-Law and Legally Blonde, so it was never going to be a nail-biter. 21 lacks any real substance or significance, it's light and breezy and isn't excellent in any area, but nonetheless you're almost certain to enjoy it. To enjoy this film you should: have at least a passing interest in cards. 21 was released in the UK on 11th April 2008.